Your Doctor's Wife: First and Second Weddings: Oh, How They Differ! 1. You consider eloping via a Las Vegas drive thru chapel in your minivan with all the kids in tow, but realize that won't do when your youngest asks if he'll get a toy at the drive thru. 2. You hunt for months for the perfect wedding dress the first time around. The second, you buy the first dress you try on... off the rack. 3. Your children are in your wedding pictures. 4. You don't register for anything, ask for no gifts, and TRULY mean it. 5. While hundreds attended your first wedding, you only invite the important people in your lives to your second wedding. . . family. 6. Not only do you have a DJ for your guests' entertainment, you also have two arts and crafts tables to entertain the children. 7. A white dove release seems incredibly stupid. 8. You foot the entire bill for your wedding. 9. The first wedding took over a year to plan. The second less than six months. You are not particular about specifics or details. It really doesn't matter that the dye lots on the ribbons don't exactly match. 10. You consider the wedding a formality. You really want a marriage. This time, you KNOW you're making the right decision by marrying the man in front of you. There are no question marks running around inside your head. You KNOW this marriage is right and the love you share is a healthy love which can withstand the the inevitable hardships life will throw at you. Join in on the fun at. . . I don't which I'm more excited about no word verification or your fabulous list! Doesn't it kill you? And now they added numbers! I give a couple tries, then I give up. Word verification drives me insane! HANDS DOWN THE BEST LIST on the linky! I could not agree more!!!! We tried explaining it to him, but he didn't get it, so we nixed the idea. Thank you! You are too kind! I'm honored you thought of me. Ah I do love this list especially the last one. It is all about the marriage, but I can't help my love for open bar! Sounds like the second wedding is much better. And don't you think they should give complimentary toys at drive through wedding chapels? #1 is incredibly funny. #10 is incredibly true! All the rest in between, incredibly enjoyable. Thanks for sharing your thoughts in such a fun way. This is great. And so true. 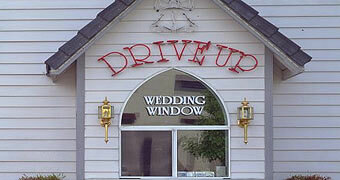 Also I cannot get the image of drive thru minivan wedding out of my head. Thanks for the laugh! !